iXBT Labs - HIS Radeon 7970 X2 Hands-On: Is This the World's Fastest Graphics Card? HIS Radeon 7970 X2 Hands-On: Is This the World's Fastest Graphics Card? 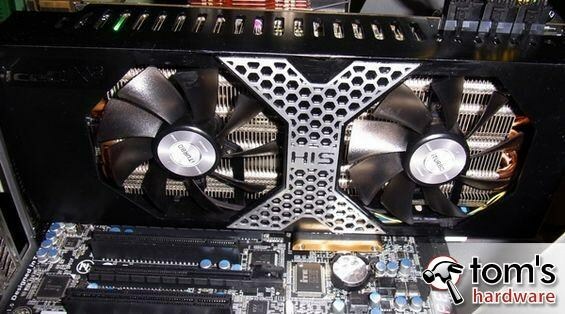 HIS has PowerColor's Devil 13 in its sights and is aiming to bring the world's fastest graphics card to the market soon by coupling two Radeon 7970 GPUs. Board Partner TUL has started selling its own dual-GPU design based on the Tahiti XT chip using several of its brands (PowerColor, VTX3D). Now HIS is joining the fray with its own take on the two-GPU Tahiti XT, which it calls the 7970 X2, making very sure to avoid the HD 7990 designation. Like TUL's versions, HIS' new card uses an impressive, massive three slot cooler. The card itself draws its power from a full three 8-pin PCIe power connectors. The main difference compared to the competition is this: the card's two fans cool two separate heatsinks, since each GPU sports its own cooler. This allows the GPUs to run at no less than 1050 MHz, and HIS claims there is still some overclocking headroom left as well. That would make HIS' sample faster than PowerColor's Devil 13, which "only" reaches 1000 MHz when OC is enabled. The two GPUs are connected using a Lucidlogix switch, which is a fairly uncommon find. Meanwhile, the memory frequency is cranked up to 1500 MHz-up from the 1375 MHz AMD specifies for the Radeon HD 7970.